SYRACUSE, NY — “It’s not the soil itself; it’s the soil life that is the most important element,” said Permaculture Consultant, Geoff Lawton. 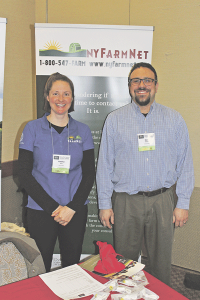 This premise anchored the Northeast Organic Farming Association of New York’s (NOFA-NY) 8th Annual Organic Dairy and Field Crop Conference and their theme: Healthy Soils-Whole Farms. 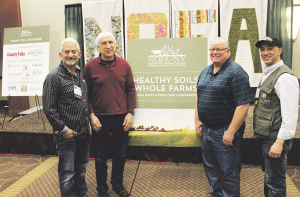 To inspire the audience of 180 farmers and soil conservation advocates, the NOFA-NY staff did well in corralling America’s soil health farmer evangelists, Gabe Brown, “Soil” Ray Archuleta and Francis Thicke. The traveling Soil Health Academy roadshow came into Central NY bringing a message of hope, soil biology, management strategies and plenty of Ray-isms and Gabe-isms that would make microbes smile. Archuleta was no wilting violet when it came to addressing soil health. “I grew up accepting a degraded resource because we had to get yields, yields and more yields. This misguided context has led our soils to be naked, hungry, thirsty, and running a fever. Don’t believe me? Look at the 2016 and 2017 dust bowl pictures from Texas and Iowa if you want proof to where the nation’s wealth is going. Many soils can’t even infiltrate a half inch of rain per hour. We’ve spent billions on conservation diapers and our rivers are still being filled with nutrient management plans,” said Archuleta. The soil man discussed the three pillars of learning: Mindset, skills and tools. He went in depth on how understanding the four ecosystem processes of solar energy, the water cycle, the nutrient cycle and community dynamics can build the “Beauty and elegance of life.” “Are the four ecosystem functions working? Look through nature’s eyes and observe if the plants and soil are one. We should strive towards biologically charged soils that look like cottage cheese and chocolate cake,” suggested Archuleta. “The snowball is rolling on appreciating the virtues of soil health practices,” said Gabe Brown, North Dakota farmer and author of Dirt to Soil. His optimism stems from his partnership company, Understanding Ag, LLC, inking a deal with General Mills to advance regenerative agriculture practices on 1 million acres of farmland by 2030. Brown along with Archuleta, Dr. Allen Williams and a team of 20 technical advisors and field consultants will support farmer training and coaching through Soil Health Academies where growers will learn how to increase farm profitability, build resiliency into the land and decrease input costs using soil health practices. Brown detailed his farm’s journey into regenerative field trials whereby increasing his organic matter from 1.7 to 6.9 percent and being able to infiltrate 15 inches of rain per hour. To achieve this, Brown focuses on building root biomass through biological primer, cover crops and adaptive grazing strategies with his livestock enterprises. “On permanent pasture the quickest way to increase biology is through trampling and multiple moves per day. Your farm is a reflection of you. We need to learn the power of observation. 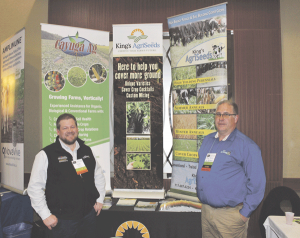 It’s the management that makes the difference in growing healthy topsoil,” heeded Brown. As one example of the marketable outcomes of regenerative farming, Brown cited Ohio farmer David Brandt’s work with the city of Columbus when it was having problems with nitrate pollution in its drinking water. Brandt convinced the city to pay farmers upstream to plant cover crops, which prevented nutrient runoff, thereby allowing the city to avoid building an expensive new treatment plant. “That’s a powerful example we hope to inspire farmers to get behind,” said Gabe. “We were pleased to put on a program that inspired farmers to think proactively and gain efficiencies through soil health practices across all genres of agriculture production,” said Bethany Wallis, Education Director.